Sharon Lorenzo gives ASE readers perspective on the Frank Stella show at the Princeton Art Museum. Frank Stella attended his 60th Princeton Class Reunion this spring and was greeted by banners all over town announcing an exhibition of his works on paper at the University Art Museum, a triumph hardly ever bestowed upon a living graduate! I found it a fitting irony that he came to campus as an undergraduate hoping to major in studio art only to find that in 1958 and still today there are no fine art majors in the curriculum. Frank Stella is 82 years old and lives in Greenwich Village with this second wife, Harriet McGurk, who is a pediatrician on the staff of the New York Presbyterian Hospital. Stella is one of the most intellectual of our modern artists, educated at Andover Academy before Princeton University. Adam Weinberg, the director of the Whitney Museum who also had run the art gallery at Andover, noted that the school’s motto is Finis Origine Pendet – the translation of which is – The End Depends Upon the Beginning. Stella’s father was a doctor and offered to fund his schooling only if he attended Harvard, Yale or Princeton. Having seen the work of Josef Albers and Hans Hoffman as an Andover teenager, Stella took the one course offered in studio art at Princeton and wrote his senior thesis for the art history department on Hiberno- Saxon Illuminated Manuscripts. Throughout his career as an artist, Stella has been deeply engaged in the life of the mind, and his work shows profound research into materials, mathematics, and the physics of large scale art production. His studio in Rock Tavern, New York, where he commutes to work, is an acre in size or as large as Palmer football stadium! In this current show at the Princeton Art Museum, we see Stella engaged with four literary sources as the inspiration for these large works on paper. In the video noted below you can see the very complex process which has evolved with his print maker, Ken Tyler. 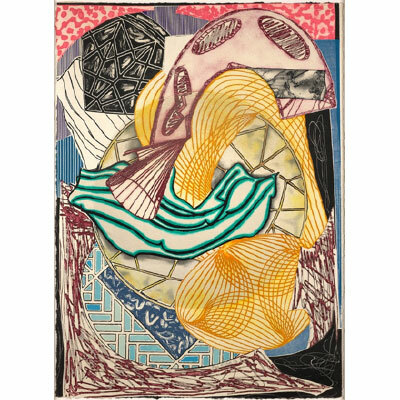 In the neighboring town of Mount Kisco, New York, Stella and Tyler work with a team to produce these works with multiple processes involving pressure from an enormous press, and huge vats where the handmade paper is assembled. From these sources, Stella found what the curators of this show call a “gestural language.” The final works are assemblages of etched, engraved, stenciled, or painted pieces of paper, wood, metallic foil, and string which create dynamic spatial illusions. Mitra Abbaspour, Calvin Brown, Graphic Imagination: Frank Stella and the Literary Print, Stella Unbound, Princeton University Press, 2018, p. 16. In each of these works, it is a struggle to see the content matched with the literary works, but that is the artistic license of the creator himself. 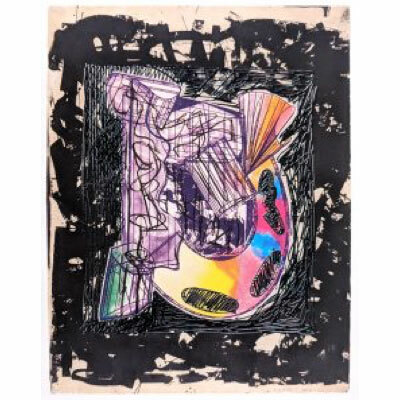 What I find so engaging is that at age 82, Stella is on the train to his studio and still aggressively producing new works for sale at the galleries of his dealers in New York – Dominique Levy and Brett Gorvy, 909 Madison Avenue and Marianne Boesky, 509 West 24th St. His work can also occasionally be found for sale on line through second hand dealers. The 24-minute video of the actual production of the prints added so much to my understanding of Stella, as I could see him at work in both his studio and at the print operation of Ken Tyler. 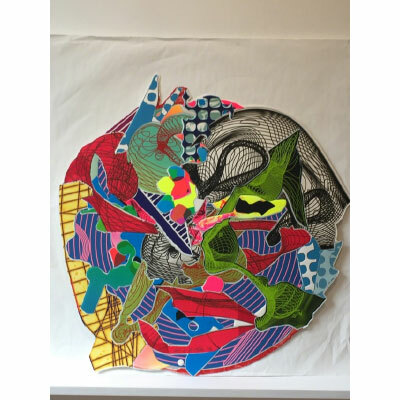 This animated dimension is something so valuable and enhances our ability to engage with the creative process of such gifted souls as Frank Stella. 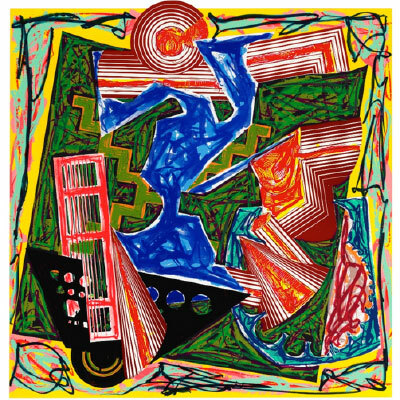 Adam Weinberg, The End Depends Upon the Beginning, Frank Stella: A Retrospective. Yale University Press, 2015, pp. 9.